Earn Free Paytm Cash From Cwikwin App By Completing 9 Easy Surveys Which Will Take Just 5 Min’s To Complete . 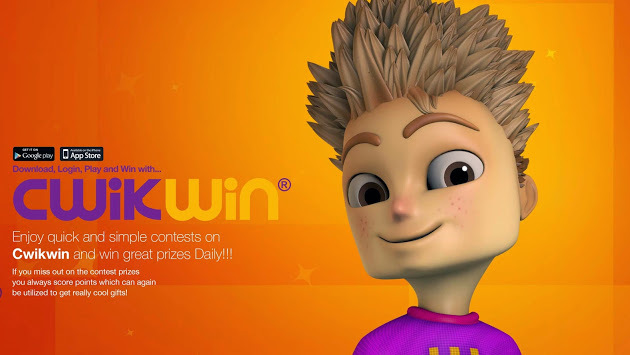 Cwikwin App is a Android App Which Is The First Contest App In UAE Cwikwin App HeadOffice Is Based On UAE . Participate in many contests from your favourite brands and win amazing prizes. Winners are selected through an Electronic Randomizer and contest prizes are shipped to winner locations. Each correct answer also wins you loyalty points thatyou can redeem for free gifts like Mobile Recharge vouchers, personal audio systems, Smartphones, Tablets and more. Everyone is a Winner! • Now Open The App. • Select Your Country And Then Click “OK“. • Now Register Your Account By Entering All Your Details Like Email , Mobile Number , Promocode , Password. • Enter Promo Code In order To Get Extra 70 Points. • Now Verify Your Number Via OTP. • After Verification You Will Get A Pop Message To Update Your Profile. • Click On “Update Profile“. • Now Enter All your Profile Data. • Then Click On “Submit”. • After That Verify Your Email. -> If You Don’t Verify It Then Points Will Not Be Credited And You Can’t Redeem It. • Now Open App And Click On Redeem Points You Will See 90 Points. • Now You Need To Play Some Quizes Inorder To Redeem Your Points. • We Have Provided Solution To The Quiz At The End Of Our Do Check It. • Then click on Redeem Option. • Now choose your Voucher or money or mobile phones depending on your Earning. √Thats it. Now redeem your Earnings! 2.For 100 Paytm Cash – 125 Points. 3.Big Bazaar Gv of Rs 750 – 500 Points. 4.Micromax Canvas 4G – 1500 Points. 5.Lenovo 3G Calling Tab – 2000 Points. 6.Flikart Rs 3000 Vouchers – 3000 points.